Trade, Buy, or Sell your pre-owned and like new Tomb Kings miniatures here on the Blue Table Painting Web Store. 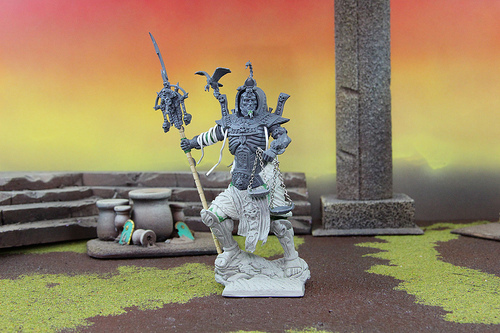 We have a large selection of Tomb Kings Accessories and models to choose from when your looking to build a custom army. Tomb Princes: Royal children of the throne that never inherited. They are slightly weaker then their father but can do well in battle. Tomb Herald- Acts as a bodyguard to the royal family and carries a battle standard into war. Priests- Spellcasters, and Necromancers whose sole purpose is to reanimate the dead for battle. Skeleton Army- Undead skeletons who wield common weapons and armor. They are the bulk of the army and can come in many different forms. Their are a host of other undead beasts, machines, and special characters to choose from when building your lethal Tomb Kings Army.